Found one file extension association related to 3D XI PC Viewer and 1 file format developed specifically for use with 3D XI PC Viewer. 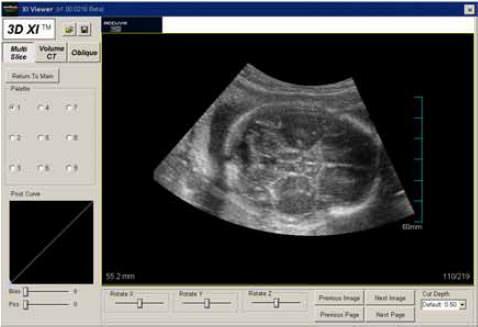 3D eXtended Imaging or 3D XITM is a collection of comprehensive 3D image processing tools that we have incorporated into our flagship ultrasound system, ACCUVIX XQ. This innovation diagnostic package, comprised of Multi-Slice ViewTM , Oblique ViewTM and VolumeCT TM will empower you with more diagnosis confidence and accuracy. With 3D XITM, you will be able to view, examine and diagnosis more clinical data in a shorter amount of time than with current existing ultrasound technologies. Integration of 3D XITM technologies, Medison is the very first and only ultrasound firm in the industry to develop and adapt CT and MRI-like imaging technologies into ultrasound systems. Whether for research or in an clinical setting, ACCUVIX XQ with 3D XITM will dramatically increase your diagnostic capabilities and clinical accuracy. The 3D XI PC Viewer software seems to be old or discontinued. If you need more information please contact the developers of 3D XI PC Viewer (Samsung Medison), or check out their product website.